Home News Wireless Tether no longer available for Android users? Wireless Tether no longer available for Android users? There is some rumors floating around that Verizon might be looking to block a popular wireless tethering app from the market. Apparently, Droid-life received a tip that Verizon was looking to squash the Wireless Tether app and then the publication started to look into that rumor. What the gang found was that, in fact, the Wireless Tether app wasn’t available from any of the phones it tested with. Wireless Tether is listed on the market, but as you can see in the image above the list of devices that can’t use the app is huge. That is most of the popular Android smartphones that are unable to get the app. I think we can assume that what is going on; here is Verizon attempting to crack down on unofficial tethering in an effort to charge for official tethering and cut down on network use. AT&T has done this with the iPhone and has texted users to warn those using cracks to tether that they will be charged $25 monthly for using tethering. Once one carrier makes a move like this you can bet that others will follow. I would be surprised if all carriers aren’t moving to block unofficial tethering in short order. 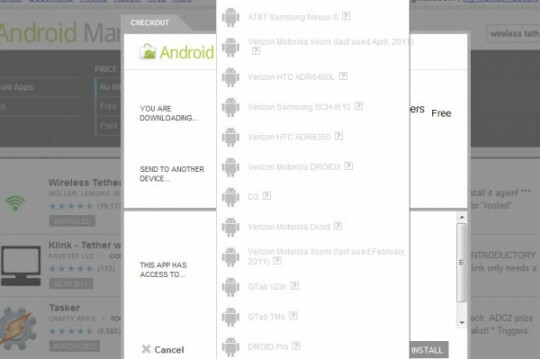 The Wireless Tether app is reportedly unavailable form devices on both AT&T and Verizon. Any T-Mobile or Sprint users who can find and use the app let us know.